Welcome to our last stamp highlights feature for our November release! We've saved one of the best for last! 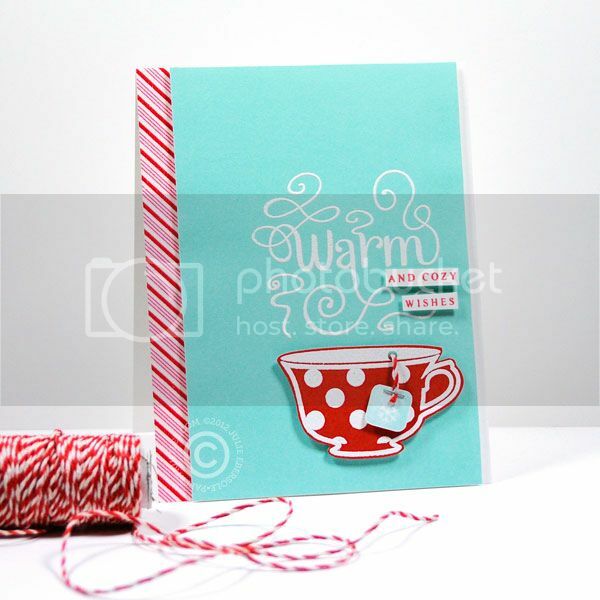 Cup of Wishes is a fun wordplay on the word 'Warm' and steam! We've paired the scripty, steamy font with a basic font and the look is classic! The sentiments works for many ocassions -- holidays, love, thank you, welcome -- it's all there! Also included are a ton of cute design building elements to make your Cup of Wishes truly unique and special. Sooo, today's guest designer hardly needs an introduction, she is someone who I've admired as a stamper from the very beginning of my own stamping career, ha! She is none other than the super cute and enormously inspiring Julie Ebersole!!! Woot woot!!! 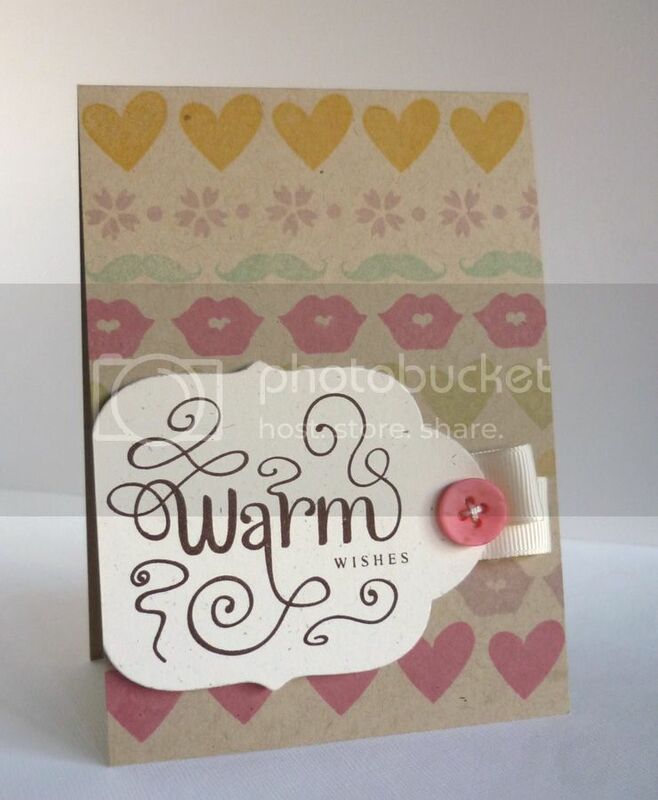 A former high school teacher, Julie was first introduced to stamping over 20 years ago and quickly fell in love! 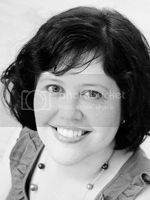 Over the years, her designs and project articles have appeared in popular trade publications, such as Paper Crafts, Stampington and Cards magazines. In addition to design work, demonstrating and teaching classes in retail stores, she went on to become the Design Team Coordinator for Splitcoast Stampers, the world's largest rubber stamping community, from 2005-2008, and also served in creative/administrative capacities for A Muse Studio (formerly A Muse Artstamps) from 2003-2011 as the company's Creative Teams Director. On her blog, Paper Trufflez, Julie regularly shares creative projects in her signature simple-yet-smashing style, interspersed with a good deal of humor and fun! She continues to enjoy independent design work, and teaching classes, both live and online, is still her favorite thing to do! To read more, visit Julie's blog HERE. And now onto our Design Team! Thank you again to Miss Julie Ebersole for joining us today! And big thanks to our fabulous Design Team for their beautiful work here. Leave a comment here and visit all their blogs and leave some love for a chance to win Cup of Wishes yourself! All winners will be announced tomorrow! Oh yeah, full reveals tomorrow! Products will all go on sale by 9PM EST tomorrow at the store too! And not to worry, I didn't slack off this month. Come back for daily doses of inspiration by yours truly!! What beautiful cards!!! And I love the font! This set looks fantastic!! Such great cards!! absolutely BEAUTIFUL cards!! love love love this set!! eek!!! i just know it! LOVE LOVE that teacup stamp! LOVE all the Fabulous Cards this set is a Must have for me.....Love it! What a fun new set and great projects by the DT! Can't wait for the full reveals! Awesome! I had purchased a fun flavor of Starbucks hot chocolate to give to the staff members at my kids' school and this set looks perfect to go with that!!! Thanks so much for designing this sweet set and the inspiring projects!!! I just found your stamps and I am in LOVE!!!!! This stamp is great! I can imagine so many cute projects using this stamp set! What a cute stamp set...the DT did a great job and I have always loved Julie's work. Another gorgeous set! I'm really excited about the full reveal tomorrow! Love these samples! Looks like a great set! Woh! You have caught my attention with those cards! Beautiful work. 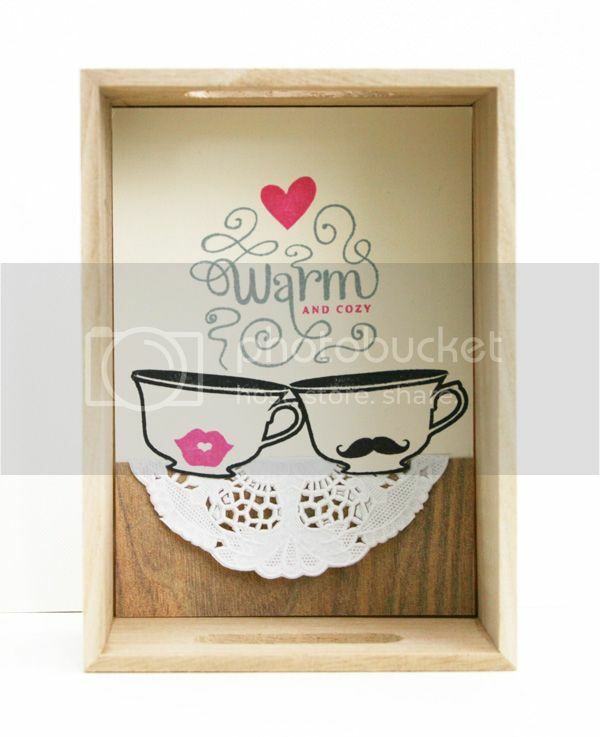 What a sweet little teacup image! TFS! These are SUCH cute samples!! This was another set I was looking forward to...and now I can't wait for the full reveal!! I love the steam image. Can not wait to see the full set! Such beautiful cards! I love your stamps! Love this teacup set! Great sentiments that can go with a lot of images! 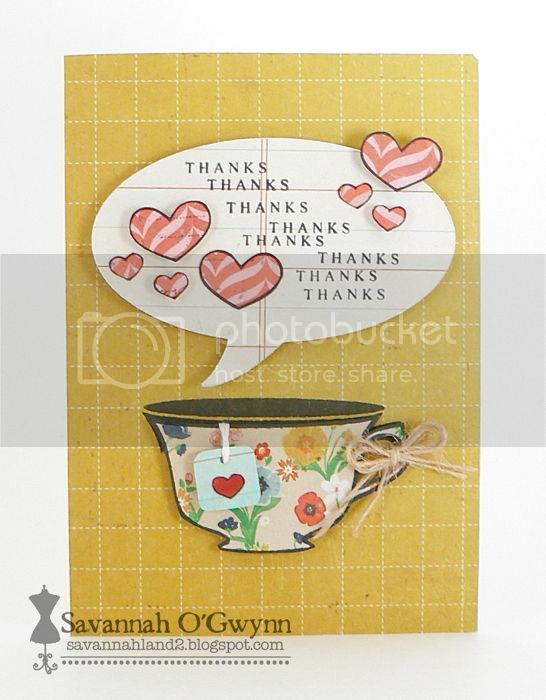 I just love the sweet little teacup images and the Warm Wishes sentiment! 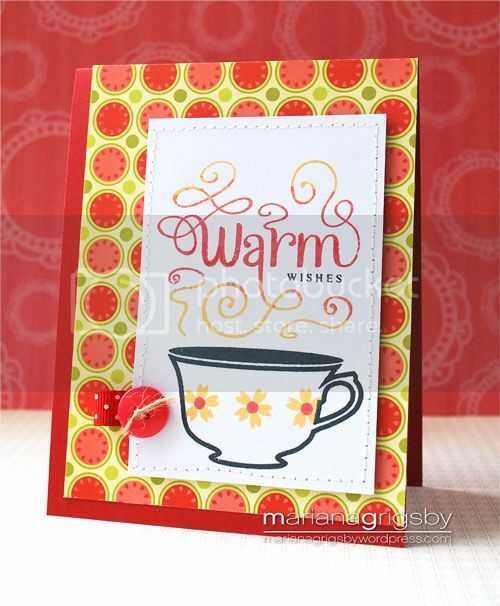 Cute tea cup stamp and love the swirls on the word "warm"
Beautiful! I love that gorgeous font! Love how you've done the sentiments for this set! Love how you all used this wonderful sentiment! All the different looks with the same teacup are fabulous! ooooohhh....I can't wait for this set...awesome cards by the design team and wahooo for Julie! Just love Julie's card. Those colors. And the "warm" swirling around. Julie's card is fabulous! all the cards are wonderful. I'm a tea drinking from way back so for tea related stamps are the best. Love love love this stamp set! The cards from your DT are fabulous! For me it's always been tea - what a fabulous set and the sentiments work well for all hot beverages (or hot guys) lol! Julie's card is awesome and the design team cards inspiring. This set is adorable! I love all the interchangeable options for this pretty tea cup! I love the warm sentiment, makes you feel warm looking at it. Love the cottage with the swirly smoke sentiment... but am also a tea lover so would enjoy those options, too! Oh my goodness!! These are such fun cards! !